“You do not know much of criminal law and hardly anything about complex criminal investigations particularly the kind involved in the present case. You do not have the humility to learn from your intellectual and moral superiors,” it added. The Government, on Friday, had told a Supreme Court bench headed by Chief Justice H.L. Dattu that the names of those who have deposited money abroad cannot be disclosed because such a disclosure would jeopardize tax agreements with nations providing those names to India. The Centre asserted its stand in an application with annexures running into about 800 pages. In this letter, he also talks about the ratification provided to the United Nation Convention against Corruption, being used as pretence to cover a huge fraud which Jethmalani exposed. 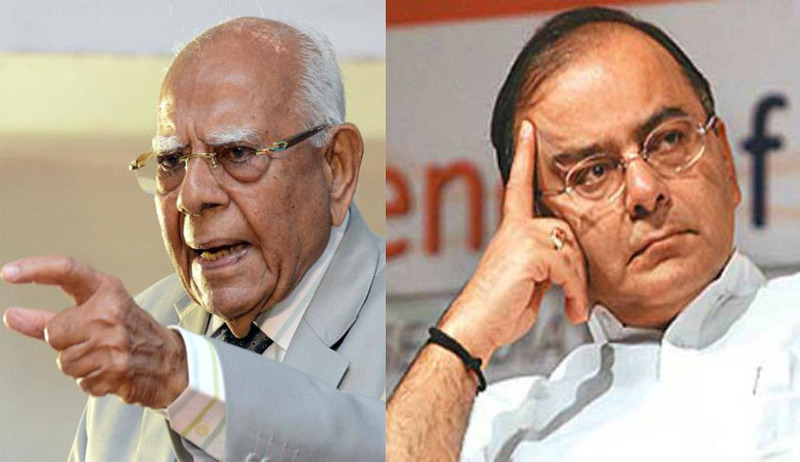 Jethmalani had suffered another setback after his Advocate-on Record Karanjanwala & Company decided to withdraw their Vakalath because of Mr. Jethmalani’s statement against Finance Minister Arun Jaitley and Attorney General Mukul Rohatgi. Read the LiveLaw story here. The apex court had constituted the SIT headed by its former judge M B Shah on a plea of Jethmalani, who had moved the court for the purpose of getting black money back to the country. It had appointed its retired judges M B Shah as the Chairman and Arijit Pasayat as the Vice Chairman of the SIT for providing guidance and direction in the investigation of all cases of black money in the country and abroad. Interestingly, the apex court had earlier rejected the same stand taken by UPA government, observing that such DTAA does not prevent the Centre from disclosing the names of the persons having bank accounts in foreign banks. It had said the treaty has been drafted in a "sloppy" manner, and cautioned the Centre not to enter into an agreement which undermines the Constitution. On DTAA, the apex court had in its earlier judgment said, "The fact that such treaties are drafted by diplomats, and not lawyers, leading to sloppiness in drafting also implies that care has to be taken to not to render any word, phrase, or sentence redundant…The government cannot bind India in a manner that derogates from Constitutional provisions, values and imperatives," the court had said. "We have perused the said agreement with Germany. We are convinced that the said agreement, by itself, does not proscribe the disclosure of the relevant documents and details of the same, including the names of various bank account holders in Liechtenstein," the court had added. The apex court after hearing AG's contention posted the case for October 28. The SC had in May given the Centre an ultimatum to constitute a Special Investigation Team to probe black money cases. It had also ordered the Centre to disclose the identity of 26 persons who had bank accounts in the tax haven Liechtenstein. Read the LiveLaw story here.